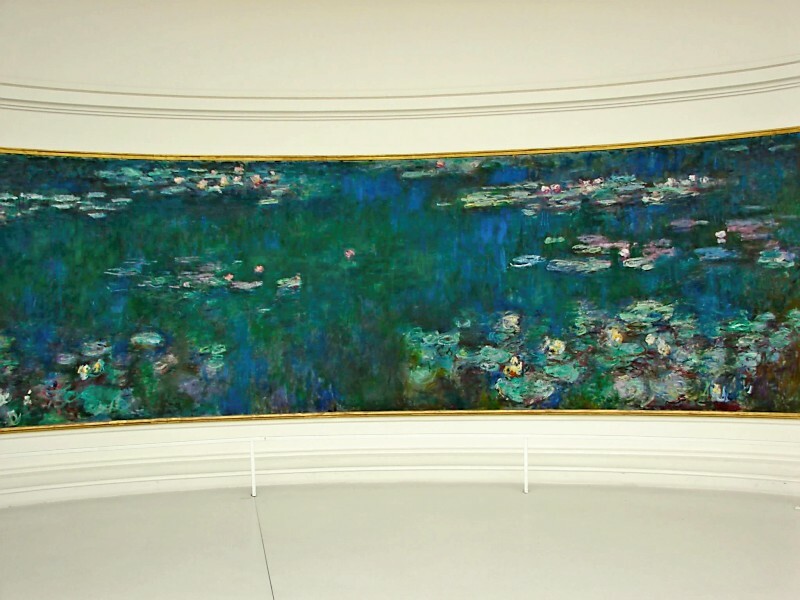 Today’s Paris memory is of the exquisite Musee de l’Orangerie, in which eight of Monet’s huge water lily paintings (called the Nympheas) are displayed in two large ovals rooms designed in part by Monet himself so as to achieve the perfect lighting and ambiance. The effect is magical. And while the museum is fairly popular, if you arrive at opening on a weekday, you’re very likely to have to the place all to yourself for a bit, making the experience truly one of a kind. 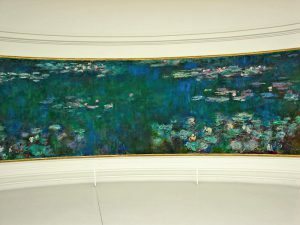 The museum also houses works by Cezanne, Matisse, Picasso, Renoir and others, but Monet’s water lily canvases are the main draw. This entry was posted in Art, Museums and tagged art, Monet, Musee de l'Orangerie, museums by Bob Adams. Bookmark the permalink.